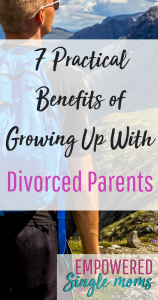 Are you wondering, “Is it really possible that boys and girls can benefit from growing up with divorced parents?” You can let go of your guilt. Yes, it is possible. My dishes were coming out of the dishwasher dirtier than when I had put them in. I am not mechanically inclined, but luckily for me, my son was home for a few days during a break from his summer job. Armed with YouTube videos, he was game for helping me tackle the project (meaning he would mostly do the work while I provided moral support). Fixing the dishwasher got me thinking. Had my son grown up in a two-parent household, he still may have learned to fix things; but in my household, he was the go-to guy for repairing things or putting new things together. He had more opportunities to put these skills to use than if his father had been always been in the same house to take care of every little repair or installation. 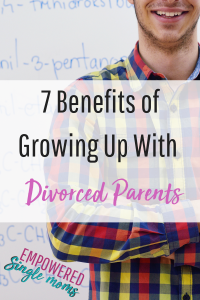 What else had my sons learned that they might have missed out on in a two-parent home? If you want to encourage your child’s fixing abilities, check out the gift I gave him when he left home here. My son is a philosopher. After fixing the dishwasher he said, “You know Mom, believing you can do something is often what makes the difference in being able to do it or not.” He reflected that fixing things, college writing, and music were all things he was able to do in part because he believed he could. Having a “How can I do this?” attitude versus a “Can I do this?” attitude has served him well. An emergency fund is good for all families. Growing up in a one-income household, the point is underlined and bolded. With only one income in the family there is less of a cushion to fall back on and often fewer resources. Little inconveniences do not become big problems when there is an emergency fund. When parents have different spending priorities children experience how households run differently with different philosophies on spending and saving. Children with divorced parents have learned by living it: both moms and dads can nurture. They learned that kids are a priority, and prioritizing spending time with them takes planning and sacrifice. When my oldest son tells me about his hopes, dreams, and joys, he talks about things he wants to do before he is a dad. He explains, “When I am a dad, I want to spend time with my kids and there won’t be as much time for all of the other things I want to do, so I will do those now.” Two parent families vary greatly in how involved dads are in nurturing, sometimes the nurturing is balanced, but often in a two parent household most of the nurturing falls to mom. It is not uncommon that dads become more involved with kids after divorce. In some ways, growing up in single-parent homes is like growing up on a farm. There is more work to do in running the household than single adults can get done alone. Besides, cleaning, cooking, yard work, and laundry are necessary life skills for adults. Yes, kids need time for friends and extracurricular activities, but they also need to do some of the household work. It not only makes them better housemates, it teaches them to see what needs to be done and to do it. They learn that there is more time for everyone to play when everyone works. My sns and I have had many conversations about careers. One of my sons put it most clearly when he said “You and Dad think about careers differently than some of my friends’ parents, so I do too. I know that I need to support myself and my family as an adult. Some of my friends’ parents think that is enough. I expect more, because you and Dad have more than that from your work. You have taught me that work is a place where I make a difference in the world. Work is interesting and is your calling. I want that and I know I can have that too.” This too varies greatly in two parent households, however often one parent’s career is considered secondary (usually mom’s career). In a single parent household work is a necessity for the adult. When you must work it helps a great deal if your work is meaningful. 7. Even When You Try Your Best, Sometimes You Fail. But Life Can Still Be Good. I am not suggesting that having divorced parents is better than having parents who are happily married to each other. It is not better. I believe the best way to raise kids is in a two-parent home where the parents are happy together, love each other, and respect each other. Do your best to stay happily married. But when that is not possible, parents need to figure out the second-best option for them. I dealt with guilt and shame when we made that second choice, but I have come to realize it was enough. And in some ways, my sons have benefitted from some aspects of having divorced parents. They have learned some lessons they may have missed out on if they had been raised by married parents. All parents deal with guilt that their best is not good enough, but parents are not perfect; we are all only human. Usually our best is enough and our children thrive and become successful, wonderful people. Even though my sons did not have a “perfect” life, they are my two favorite people in the world. And that imperfect life? It has prepared them well for a successful adulthood. I made a private Facebook group just for you. Please join us in Empowered Single Mom Tribe.